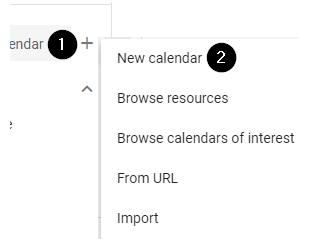 How do I create and share a Google Calendar? Going to Google Calendar directly. 3. On the left side of the page, click the plus symbol (+), then select New calendar. 4. Enter a name for the calendar (such as the class name & section, or course number), then select Create calendar. 1. 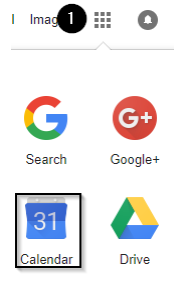 Under “My calendars”, mouse over the calendar you want to add. Next, click the vertical ellipsis. "Finally, select Settings and sharing". 2. Under “Access permissions”, check the box next to "Make available for University of Northern Iowa". 3. Scroll down until you see “Integrate calendar”. Select Customize. 4. Using the options on the left side of the screen, customize your calendar as desired. 5. Once you are ready to embed, click Update HTML at the top of the screen. 6. Select all the code in the text area, then right click and select Copy (alternatively, use Ctrl + C). Note: Professors can embed Google Calendars into their Blackboard courses. By embedding a Google Calendar into Blackboard, you are able to display due dates and other events to students. The students can add this to their personal Google Calendar as well. For full instructions, visit the UNI eLearning Suite FAQ. 7. Under "Access permissions", click on "Get Sharable Link" in the bottom right corner. Click on "Copy Link" to copy the link to your clipboard.